This Beef Stroganoff recipe is loaded with tender beef. It’s creamy delicious and the only thing missing from this comfort food is the guilt. We were visiting friends over the weekend who had just returned from a River Cruise. While talking about some of the amazing meals they had one of the dishes that came up was Beef Stroganoff. John’s taste bud alert bells started ringing. He stated he hadn’t had Beef Stroganoff in a long time and it sounded so good. This post was sponsored by Hiland Dairy, but the content and opinions expressed here are strictly my own. The next day John was still pushing Beef Stroganoff. All I could think of was there goes our New Years resolution to eat healthier and it’s not even February yet. Being the wonderful wife that I am, I decided to make him his Beef Stroganoff and set out to see if I could lighten it up. 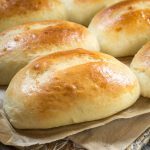 Some of the classic recipes include can soup or cream that’s just packed with fat calories and sodium. I’ve been able to replace cream in the past so knew that’s what was needed. Other changes that I could make was adding vegetables and lean meat. 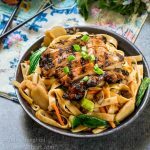 I also replaced the thick egg noodles that John suggested with thinner whole wheat fettuccine noodles. When I went to get my ingredients, I added carrots and onion to my mix. 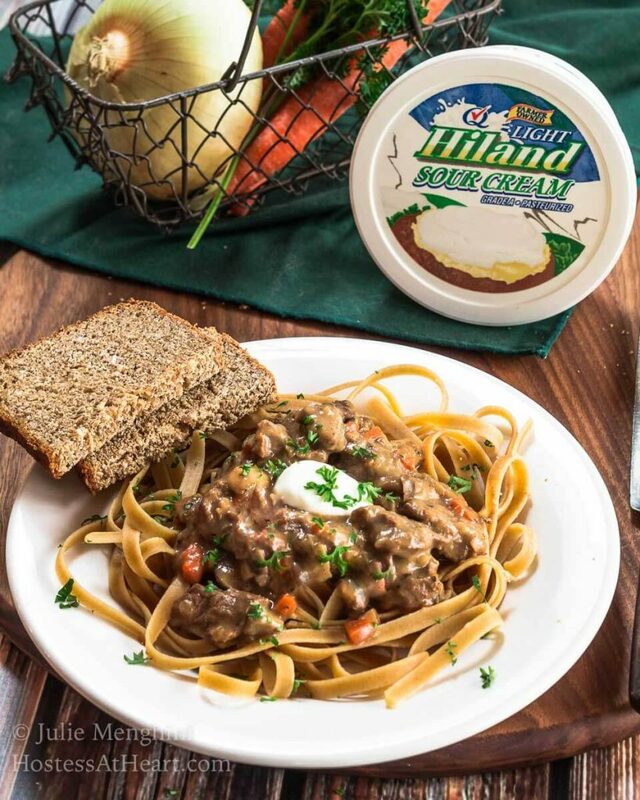 I replaced the mushroom soup with a mix of fresh earthy mushrooms, and instead of cream picked up some Hiland Dairy Light Sour Cream that has 50% less fat and one-third fewer calories than regular sour cream. This Beef Stroganoff recipe is loaded with tender beef. It's creamy delicious and the only thing missing from this comfort food is the guilt. Trim chuck roast of fat and cube into 1-inch pieces. Liberally salt and pepper. Lightly cover the bottom of a dutch oven with olive oil. Over a medium-high heat brown meat. Don't crowd and brown in batches if necessary. Remove meat. Add carrots and onion to the pan and cook until slightly softened 3-4 minutes. Reduce heat to medium. Add meat back into the pan. Sprinkle with flour and allow to cook until no visible flour remains approximately 2 minutes. Pour in beef broth and stir until thickened. Stir in the mushrooms. Simmer for approximately 1 hour. Remove stroganoff from the heat. Salt and pepper as needed. Stir in Hiland Dairy Light Sour Cream and parsley. Serve over noodles and garnish with additional Light Sour Cream and parsley. Simmering beef will allow it to tenderize and will enhance flavor. Cooking time can be reduced if desired. My finished dish didn’t lack one bit of flavor. It was loaded with tender beef and using Light Sour Cream made it just as creamy as if I’d used full-fat cream. This was a comfort food dish that we loved and the only thing missing was the guilt and this dish didn’t derail my New Year’s resolution. That beautiful Organic Honey Whole Grain Bread was delicious for scooping every last bit of that Beef Stroganoff up too. Another healthy pasta dish that we love is our Healthy Shrimp Fettuccine recipe! Oh yes…this is certainly something I need to try! Thank you, Jhuls! So many of these dishes are so full of fat and calories. I didn’t miss them in this dish. I love the idea of anything “healthier”. 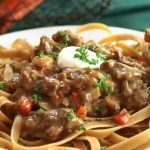 My husband loves stroganoff but I usually stray away from it, will have to try out your healthier version for sure. Thank you for sharing! Thank you Marguerite! I was like you I stayed away from it because it just wasn’t good for us. I didn’t miss that in this recipe. Thank you, Natalie! It sounds like it’s cold even in your area? 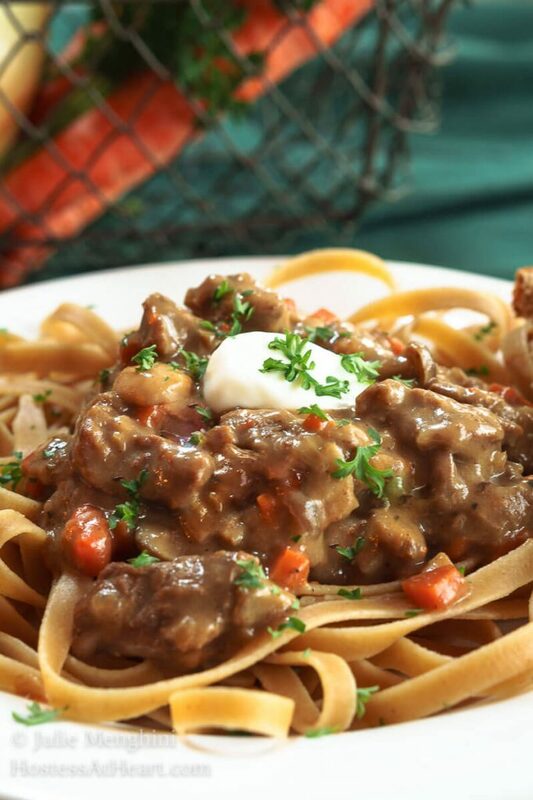 Beef stroganoff is such a great comfort food recipe! I can’t wait to try yours! I bet even David would go for this recipe even if the word “Healthy” is involved…lol! Looks delicious! He’ll never know! That’s usually the approach I take with John. LOL! Yum!!! You took all of the guilt out of eating this!! 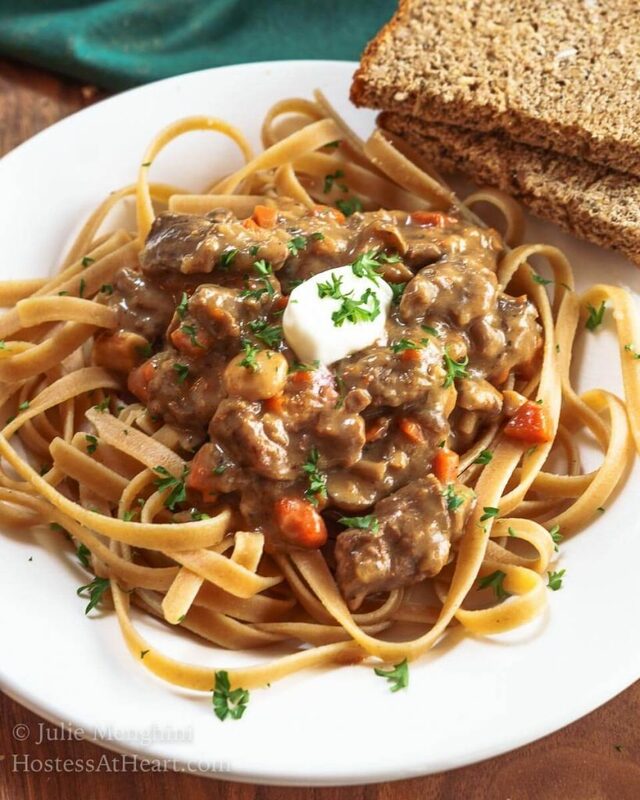 Beef Stroganoff is one of my absolute favorite comfort foods from childhood! I love this lightened up version! Thank you! It was a lot like the dishes I grew up with too and was sure delicious. This brings me back to my childhood. I love this recipe and how you used leaner meats and veggies. Using light sour cream is a great way to get that creamy tangy flavor but make it healthier! Thank you, Jennifer! It was a dish that was on my table as a child too. We loved it. Such a warm comforting dish – love that you’ve made it healthier. Great meal perfect for a weeknight and so yummy!! This recipe looks delicious! I can’t wait to try your recipe. 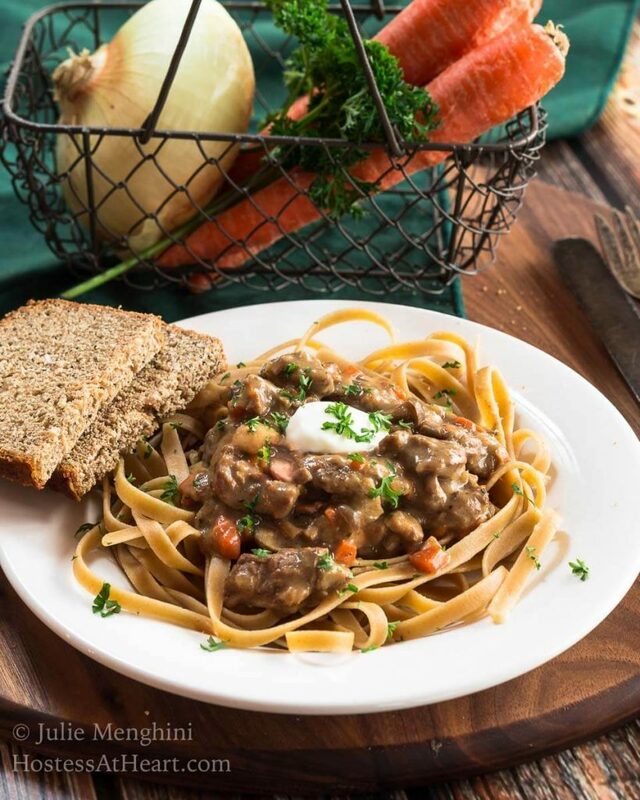 Stroganoff is a favorite in our home. Thank you Nicole! I hope you will stop back and let me know what you think! Stroganoff was always one of my favorite dinners! Yours looks awesome, and I love that it’s healthier! Thank you, Debi! We sure didn’t miss those extra calories. Hearty AND Healthy?? Count me in!! 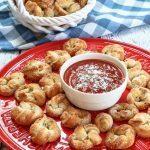 Looks like the perfect comfort food meal! Looks like a delicious lightened version of comfort food at it’s best. 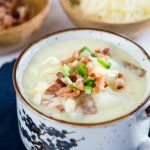 I always use light sour cream and it really does not affect the flavor of a recipe. Thank you Judi! I agree that there just isn’t any difference using up the lightened sour cream. A great comfort meal youve made here! I look forward to trying out your healthier take on it! Thank you, Angela! I hope you’ll let me know what you think. 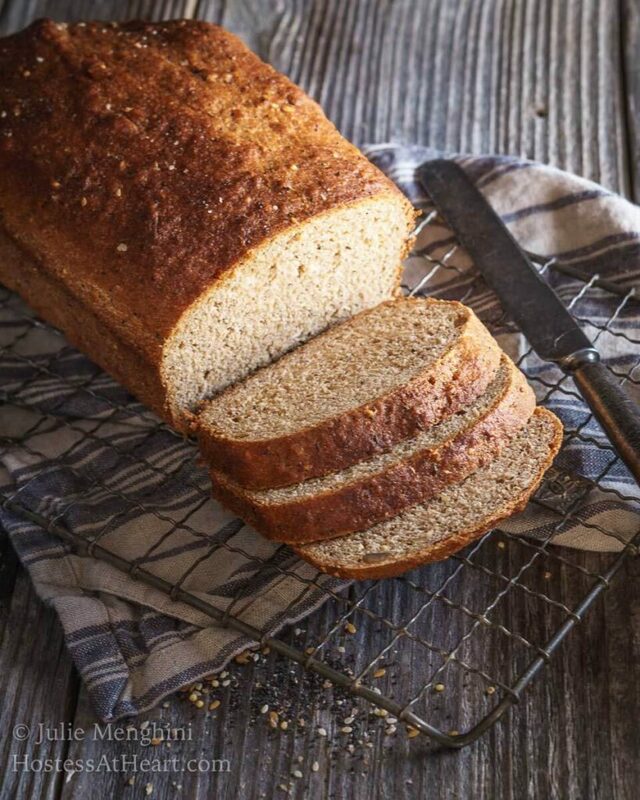 I love the healthy swaps in this recipe. And adding carrots? Never thought of that, but I bet they taste delicious with the mushrooms. Thank you, Christie! It was almost like carrots should have always been in that dish. Julie, this looks delicious! You’ve also made it seem like even I could make it. (I admit… I’m not the best in the kitchen.) 😀 Hugs. I know you could do it Teagan! Thank you so much and hugs right back to you! Sounds scrumptious – love the substitutions without sacrificing it’s depth of flavor. We love beef stroganoff in my house and your healthier version sounds absolutely delicious! Thank you, Lisa! It was just as good in my book. Thank you, Loretta! I used to use can soup in so many dishes and sometimes would eat the whole thing for lunch. We just didn’t know then what we know now and it was easy to put together and get the family out the door. That bread is the one that I posted on Tuesday. I am pretty sure that I used my share of butter and honey! I love beef stroganoff and it’s been a very long time since I’ve made it. Your lighter version sounds just perfect. Thank you, Suzanne! You can serve it over rice or just eat the stroganoff with a side salad for even fewer carbs. Julie, this looks amazing! I love that you replaced the cream of mushroom soup. Such a warm and comforting dish 😀 Happy New Year my friend! Thank you so much, Antonia! There was a time I couldn’t cook without can soup! I hope you had a wonderful New Year too Antonia.